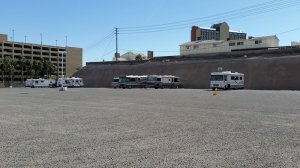 While staying at another casino in Laughlin, we checked out the overnight RV parking. Designated area across the street has 16 designated RV parking sites for free overnight RV Parking. There were about 5 RV's there.